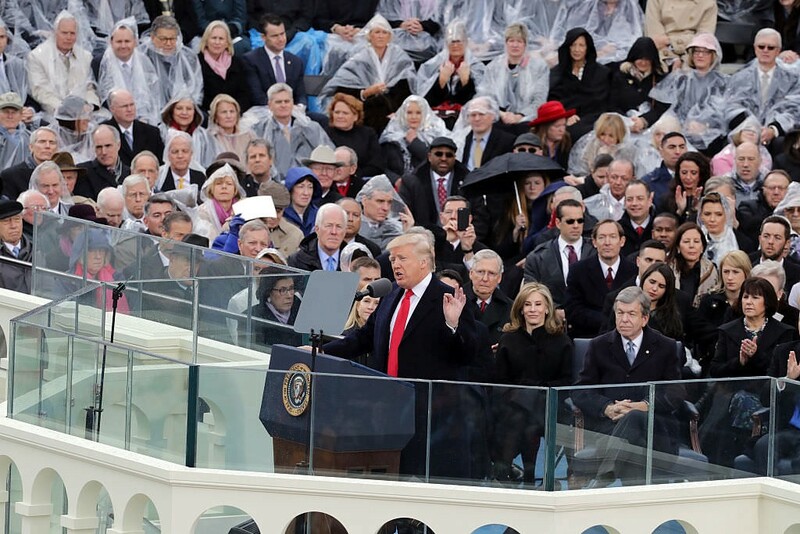 Did God Make It Rain for Trump’s Inauguration? One wonders what Noah might have thought of this scriptural analysis. It is telling that the reverend would contribute to the inauguration, not only a benediction, but an interpretation of an omen. Our custom of inaugurating government officials derives from the ancient religious practice of investing kings and magistrates with power through a ceremony in which a priest interpreted natural events as signs that a god favored the office-holder. “And so they unanimously voted to offer the sovereignty to Numa Pompilius. Being summoned to Rome [Numa] commanded that, just as Romulus had obeyed the augural omens in building his city and assuming regal power, so too in his own case the gods should be consulted. Accordingly an augur (who thereafter, as a mark of honour, was made a priest of the state in permanent charge of that function) conducted him to the citadel and caused him to sit down on a stone, facing the south. The “augury” offered by Reverend Graham was only the latest in a millennia-old tradition. Opponents of Trump have denounced it as an intrusion of superstitious religiosity into our secular governing institutions. But in truth, Graham’s divination fit right in. After all, it was delivered at the Capitol building, whose architecture recalls a Roman temple, and whose name derives from the Capitoline Hill of ancient Rome, site of the the Temple of Jupiter Optimus Maximus where the augurs presided. Through this ritual, a man who, a moment before, only had the right to dispose of his own person and property, is transformed in the minds of the civic religion’s believers into a “President”: a man with the “authority” to seize the earnings and property of millions of Americans and to bomb any of the rest of the planet’s billions at his discretion. Such wholesale theft and murder is transubstantiated into “taxation” and “war” through the pomp and circumstance, the hocus pocus of the inaugural ritual. An inauguration is a superstitious bestowal of irresponsible power that no one should have. Rain or no rain, regardless of the person being sworn in, inaugurations never augur well.